I just learned how to use the Pages app which is a great resource for teachers to use in their classrooms. What I love abou this app, on the teaching side, is that it gives you an opportunity to create "text-book" looking material where you can create assignments and even publish work. I found the formatting to be easy and fun to use. Editing text and making it look professional is not difficult at all. There are many built in options that don't make you work very hard to learn how to utilize. This app is also a great resource for students to use. It gives them a way of putting their materials and projects into professional looking formats. A big plus for students is that this app is not overly difficult to use. Yes, it can be time consuming if you are first learning how it works, but once mastered a little, I believe students will like using it. There are simple tools to use on Pages that help your products look more professional. Examples of these tools are the easy to access style options for text, differences between title text and body text, borders for pictures, graphs and charts, and the ability to move things around. I found nothing hard to use, just a bit tedious at times. I recently went through the Apple Teacher Pages iBook that helped me learn how to use this app. During the book, I created a project which I have attached as a PDF below. If you want a basic idea of what pages can do, please click on the link and find out! 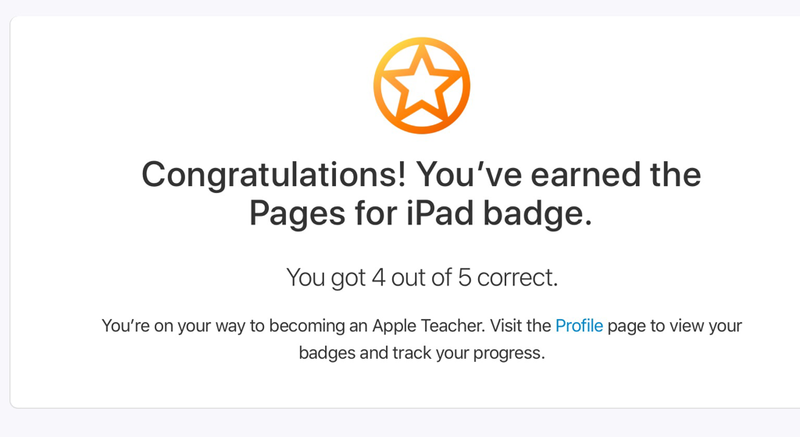 I have also completed the test for the Apple Teacher Pages badge. If you are a teacher, I recommend you do this too so that you can build up the amount of tools you have to access in your classroom!